Honestly, I debated whether or not I should even share the December Paper Pumpkin kit. It sold out way back in the middle of November and I know that was a disappointment to some who didn’t get subscribed in time. But then I decided I should share it so that those of you that did subscribe in time get to see it assembled. December’s kit is a mini calendar that comes with a pre-made box, perfect for gift giving. You can make the calendar and then give it to a friend. Or you can keep the calendar and use the box for something else. 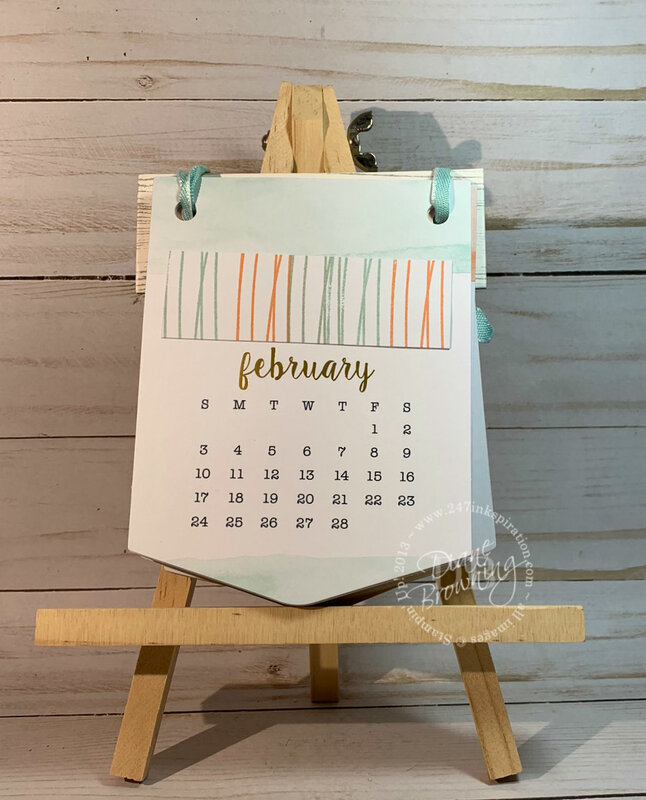 The calendar is an 18 month calendar and all the pages come pre-printed. Since there are more than one of some of the months, be sure to double check the dates before you tie it all together. You wouldn’t want to put the wrong January in the wrong place. The stamping is the white bar that you see just across the top of the month. The stamp set comes with a variety of shapes and squiggles so you can make each month different. And for those of you that want to be prepared when your January kit arrives, we have some inside information on what to expect for January. Next month’s kit will make 24 adorable Valentine’s treat packages. Plan to order extra kits if you want to make these for your kids classroom Valentine’s Treats. The coordinating colors are: Crumb Cake, Flirty Flamingo, Lemon Lime Twist, Melon Mambo, Petal Pink, and Pool Party. And, the January kit will coordinate with the Animal Expedition Suite on pages 26 and 27 of our Annual Catalog. I’m so excited to see what they came up with! 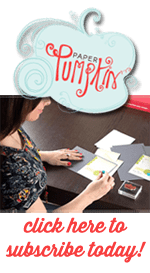 If you order your Animal Expedition Suite early January, you’ll have it in plenty of time for the Paper Pumpkin kit to arrive. If you haven’t checked out my webstore in the last couple days, you probably haven’t noticed that the Clearance Rack has a bunch of new items that were added. Click on the Order Online button on the right to go to my store. Don’t wait because products are already selling out. Oh my goodness! Guess what’s now available. It’s a tote bag for your Stamparatus. And it is beautiful. There is plenty of pockets inside to hold your Stamparatus, some extra plates, and your grid paper. You are going to love this tote bag. This bag will be available now and it’s $29 (item #149695). If you’ve been waiting to purchase the Stamparatus until the tote was available, you can buy both as a bundle for $78 (item #151961).